Since independence and even earlier, India has been characterized by an enduring duality in which the reality of an inegalitarian and oppression-ridden society has co-existed with a widespread and even growing urge for equality and justice. The inequalities prevailing in Indian society are multi-dimensional in which new ones emerging with time are intertwined in complex but mutually reinforcing ways with those handed down from the past. Caste and gender discrimination are knitted into the fabric of a society whose economic domain is also marked by sharp inequalities in control over resources and exploitative relationships. Most Indians are subject to at least one among several inequalities and oppressions, an overwhelming majority of them to more than one acting in tandem and a considerable part to all of them. In the absence of changes that would address the structural roots of these, affirmative action in the form of reservations in education and public employment - for members of social groups who are disadvantaged by the social realities from accessing the limited opportunities for these - has been the only substantive response of the Indian state to the demands for equality and justice. The creation and development of this reservation policy and its implementation has also been impaired by the resistance from the more privileged sections of Indian society and their power. Opposition to caste-based reservations has expressed itself from time to time without succeeding in abolishing it or preventing some expansion in its scope. Indeed, how far at least the political discourse in India had moved was reflected in the fact that anti-reservation movements had to also couch their opposition as a fight against ‘casteism’. Another example of this was the emergence of a political ‘consensus’ such that no major political formation operating within the framework of India’s electoral democracy opposes the reservation policy, even if in government they only serve the interests of the privileged. More recently, we have also seen traditionally higher status caste groups demand recognition of their ‘backwardness’ and the extension of the benefit of reservations to them. From the old anti-reservation movements that were rooted in pure caste prejudice to these new demands for reservations that could have some basis also in the agrarian crisis produced by the impact of neo-liberalism in India – the significant existence of poverty and low economic status within the minority of the population excluded from the ambit of caste-based reservation has always been evoked. Are they not disadvantaged too and aren’t many of them poorer than most of the actual beneficiaries of reservation? This is the question that has been thus always posed. It is, however, a gross manipulation of the idea of equality if the disadvantages of economic backwardness of some within them are highlighted only to create an upper caste consolidation in favour of preserving a structure of caste and class privilege – which is also at the root of the economic backwardness being referred to. This would be no different from the contradiction that has always been visible in India but become even more marked in the last three decades – the invoking the poverty of most Indians to rationalize economic policies which have exacerbated poverty, unemployment and inequality. A fundamentally different politics is to rupture any such upper caste unity and create instead a wider unity of the underprivileged in the struggle for transforming the socio-economic structure of caste and class privilege itself – which is certainly not the politics which the BJP represents.A case for incorporating within the reservation system some component based on an economic criterion had emerged in the past as part of an effort to create a larger social consensus in favour of the policy of reservation in education and public employment for SCs, STs and subsequently OBCs. However, the Modi government’s desperate move to introduce reservation for ‘economically weaker sections’, sidestepping through a recourse to Constitutional amendments the constraints on such reservation imposed by Supreme Court judgments, clearly doesn’t fall in that category. It is instead a naked attempt to fortify its electoral prospects by creating an upper caste consolidation. There are so many aspects of the introduction of reservation for ‘economically weaker sections’ that are obvious indicators of its true political intent. The first is of course It’s timing – the fact that it was introduced four and a half- years after the Government assumed office and as the country is heading towards the national elections, and soon after the BJP suffered electoral reverses in three states it had been ruling, made it clear what prompted it. The haste with which the Constitutional amendments were pushed through in a matter of such magnitude, bypassing normal Parliamentary procedure and without the conduct of any proper study which could provide a sound basis for any policy, only adds to the evidence of the cynical calculations behind the Modi government’s move. Even the data generated by the Socio-Economic Caste Census but not yet made public was not used for this purpose. That the measure is largely for propaganda purposes and has little real benefits to offer to anyone is also clear from the Modi Government’s record on the employment front, particularly in public sector employment.Union Budget documents show that about 75,000 jobs were lost in Central Government Establishments (Ministries, Railways, Postal Department, Police, etc.) between 2014 and 2017, and evidence indicates further reduction in 2018. According to the Public Enterprises Survey, in Central Public-Sector Enterprises (PSEs) total employment has shrunk from 16.91 lakhs in 2014 to 14.66 lakhs in 2018 – 2 lakh 25 thousand jobs have vanished. RBI data shows that in Public Sector Banks, some trend of increase between 2009 and 2015 was reversed and in the next two years some 35,000 jobs were lost. Thus, if the jobs to which reservation could apply are themselves disappearing, how many can get the benefit of any new additional reservation flowing from the Constitutional amendment whose passage by the Lok Sabha was described by Modi as “a landmark moment in our nation’s history”? As regards admissions to higher education institutions, the MHRD and the UGC which have been quick to instruct Central institutions to implement the new reservation policy, have not too long ago also been the chief actors in slashing the number of admissions to the research programmes in these institutions through the imposition of the UGC 2016 Regulations. 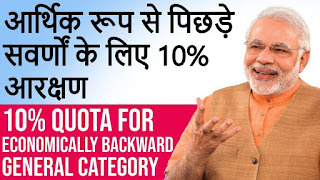 That the Modi Government is appealing to upper caste identity rather than economic backwardness is also evident from the criteria by which the economically weaker sections are being defined. Fixing of the level of the annual family income below which one would be deemed to be economically weak and eligible for reservation at Rupees 8 lakhs (or almost 67,000 rupees a month) is bizarre given India’s economic realities where more than 95 per cent of the population has lower income level. The number of individuals declaring an annual income above Rs. 8 lakhs wouldn’t even number 1 crore in a population of over 130 crores. A significant section of even regularly employed government and public sector employees would be having an annual income below the 8 lakhs level. Would the Government be willing to use the same criteria of economic backwardness to identify who should be beneficiaries of ‘targeted’ schemes or use it as a justification for raising MNREGA wages and raising the minimum salary levels of its own employees? Other than in the context of reservation, would the Modi government be even willing to concede that such a large proportion of Indians are economically backward and poor? However, while all the above have allowed people to see through the hollowness of this “welfare” measure of the Modi government and to understand its true intent, there are also deeper issues which go beyond these. 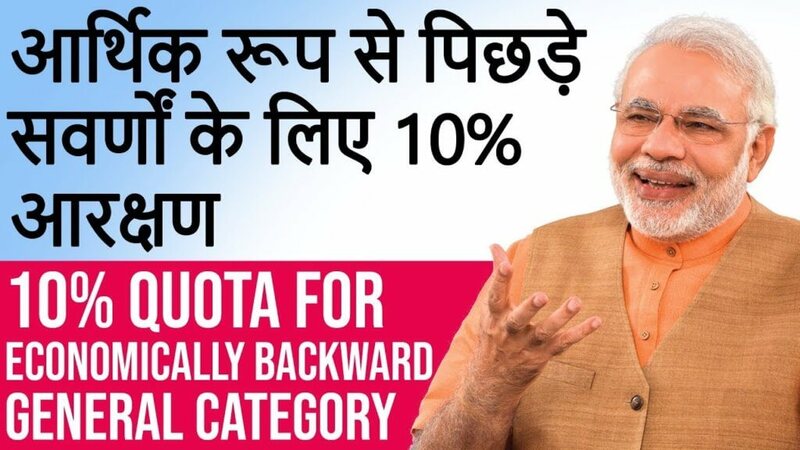 The policy of reserving 10 per cent of seats/jobs for the economically weaker sections, as is being implemented by the BJP government, in effect is insidiously redefining and perverting the meaning of ‘equality’. This may be the real long-term consequence of the cynical short-term and ill thought out gimmickry of the Modi Government. If it passes judicial scrutiny in its current form, it might mean a more fundamental change to the Constitution. In the reservation policy that has been in force, general category candidates were eligible to be considered for all unreserved posts. This category therefore doesn’t refer to any distinct social group for whom 50.5% of seats or positions were reserved – it in fact includes all sections of society but without any reference to their social and economic position. Any one making the cut in the general merit list (even someone eligible for SC/ST or OBC reservation) was assigned an unreserved seat/post. The 10 per cent reserved for economically weaker sections under the new policy, however, not similarly open to anyone irrespective of social background as long as they meet the additional criteria of economic backwardness – it is only available to “persons who are not covered under the existing scheme of reservations for the Scheduled Castes, the Scheduled Tribes and Socially and Educationally Backward Classes”. In this exclusion of SCs/STs and OBCs from its purview lies a problem. ‘Economically weaker section’ is defined solely based on some economic status. As such, it cannot privilege those who have this exclusive disadvantage vis-à-vis those who have an additional disadvantage derived from caste status. No constitutional amendment should be able to bring such a privileging within the ambit of ‘equality’. It is precisely such a privileging, however, that is inevitable if the economically weaker among SCs, STs and OBCs from the purview of the 10 per cent reserved for the economically weak. Even a poor SC/ST or OBC candidate with a higher merit position could have to be passed over to allot a seat or a post to someone in this set of reserved positions. Indeed, since the income threshold for determining who is economically backward is identical to that for separating the creamy layer among OBCs, the new policy of reservation means excluding all SCs, STs and OBCs from 10 per cent of seats/posts - which amounts to discrimination and reversal of one of the underlying principles of affirmative action. When the same economic level is also said to determine who is purely backward economically as you employ to exclude the creamy-layer among OBCs, it amounts to saying that OBCs and anyone who does not suffer any disadvantage from caste status are also the same if they have the same level of economic disadvantage. Both are entitled to reservation on an equivalent basis – one to 27 per cent of seats/posts and the other to 10 per cent of the total- which is the same as saying there is 37 per cent reservation for the economically disadvantaged divided up among two groups of those so disadvantaged.In the process what is forgotten is the fact that the creamy layer in OBCs is not supposed to be made up of those who are free from economic backwardness but those whose economic privileges are of such an order as to enable them to overcome the social disadvantages of their caste status. A distinction is made in this regard between OBCs and SCs only because the latter are subject to the most extreme social oppression which no economic status can neutralize. The equation of the non-creamy layer among OBCs and the economically weak among others who don’t suffer a caste related social disadvantage also of course increases the proportion of the latter even in the total population of the country. Even then, it has not even been ascertained what is that share or what would be the share if a more reasonable criteria of defining economically weak were to be adopted. Are they high enough to justify a 10 per cent reservation for that group when the OBC reservation is capped at 27 per cent, a proportion that is way-way below their share in the Indian population? Indeed, if the proportion of reserved seats/posts can now exceed 50 per cent, one might ask - what is the rationale for keeping the OBC reservation capped at 27% when their proportion in the population is much higher? That the SC/ST reservation percentages are closer to their shares in the population while that in the case of OBCs was much less can be justified in different ways including the fact of differences in the degree of discrimination and oppression these social groups have traditionally been subject to. However, no such rationale can justify the economically backward within those social groups not covered by any other reservation having any disproportionately larger benefit of reservation as compared to non-creamy layer OBCs. Within the 37 per cent, the division into 10 per cent reservation for the former and 27 per cent for the latter would without doubt amount to privileging the former unless they were far more than 20 per cent or so of the total Indian population. In other words, it has to be assumed that social groups who enjoy a disproportionately large share in the control over economic resources and representation in higher income groups are also almost entirely economic weak! Reservation for SCs, STs and OBCs and such traditionally excluded groups also has a representational element–and it can be so because those getting the benefit of it do not lose in the process their membership of the social groups which they represent. If the reservation is only on a purely economic criterion, the same doesn’t apply, particularly in public employment. If the bar for defining ‘economically weak’ is kept close to the minimum income in public employment – then anyone entering public employment ceases to be ‘economically weak’. If on the other hand the bar is kept much higher, as it has been, then the ‘economically weak’ automatically have ‘representation’ in public employment – a significant proportion of such employees is automatically “economically weak” and this is because the government pays them too little! The only way, therefore, that reservation for economically weaker sections does come under the ambit of ‘representation’ is by its limitation to those who do not have the benefits of SC/ST/OBC reservation – but that makes it a representation of those who are socially privileged and already over represented rather than of those who are economically backward. The complex issues opened up by any move to introduce reservations for economically weaker sections may have been examined, scrutinized and even addressed in the formulation of a reservation policy – provided the intentions behind it were genuine and the necessary study, deliberation and discussion had been undertaken. That is not something the Modi government has time for – in its haste to play on the upper caste sentiments that might exist on either side of an economic divide, it has initiated another jumla that achieves little in moving things forward and instead undoes some of the achievements of the past. That, unfortunately, has been a bit of a pattern with it.